The Rochester Chronicle' is a version of another popular chronicle called the 'Flowers of the Histories', into which a monk called Edmund of Haddenham interpolated material relating to Rochester. 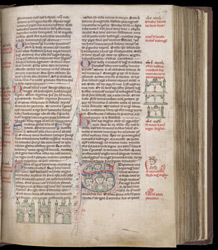 This is the unique manuscript of his work. It has the added interest of a large number of marginal drawings and a few fully painted miniatures which relate to the text. It also has some historiated initials and a large number of amusing penwork doodles. There is little doubt that this manuscript was made at Rochester, perhaps by or under the supervision of Edmund himself. In the lower margin are the Cistercian churches of Waverley (in Surrey), Fountains, and Rievaulx (both in Yorkshire), and in the right-hand margin are Quarr )on the Isle of Wight), Combermere (in Cheshire) and Stratford (in Essex).